Actors have their Oscars and musicians have the Grammys. For us humble home builders, there isn’t anything quite so glamorous, but here at MileStone, we’ve been honored to accept awards in our field. We don’t like to brag, but in the interest of helping you get to know your builder better, we thought you might like to know about a few of the home builder awards and honors we’ve received over the years! In 2017, the Austin Business Journal Residential Real Estate Awards (RRE) honored us with the Production Home Builder of the Year award. 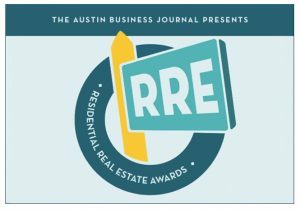 The RRE Awards honor the best quality home builders, residential real estate agents and master-planned communities throughout the Austin, Texas, area. We also received this award in 2012! when the 2016 list is announced in just a few weeks! Every year, the Austin Business Journal announces its Fast 50, a list that ranks all of the fastest growing companies in Austin (a city that happens to have one of the fastest growing economies in the nation). MileStone has made the cut year after year, ranking at No. 6 in 2013 and 2014, and coming in at No. 9 in 2015. Garrett Martin, our CEO, was recently nominated as one of the finalists for the Ernst & Young Entrepreneur of the Year 2016 Award in Central Texas. Everybody in the MileStone family is very proud of his achievements! The Home Builders Association (HBA) of Greater Austin awarded MileStone with the prestigious President’s Choice Volume Builder Award in 2011. The HBA recognizes the best home builders in Austin, Texas, every year. In 2016, another milestone was achieved. MileStone Community Builders was included in Builder Magazine’s Builder 100. This annual ranking of the top 100 building firms in the United States includes a diverse group of companies from all over the country. Needless to say, we’re proud to be on the list. As an added bonus, MileStone also ranked in the top 10 list of fastest growing companies in the 2016 Builder 100! Yes, 2017 is shaping up to be another big year at MileStone. So, if you’re looking for a quality, then we’ll help you find the perfect, dream home. Get to know us better with our online summary of some of our home builder awards. Also, don’t hesitate to contact us today to learn more about the company and our homes!